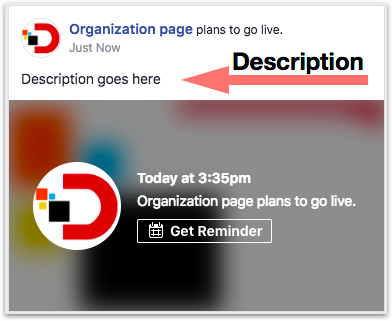 This article explains how titles and descriptions are displayed on Facebook for live notifications and live streams. Once the live stream begins, the description will be displayed over the video. Once the view is enlarged, title will be visible on the top right. Description is displayed under it. When a stream is scheduled atleast 15 minutes in the future, at exactly 15 minutes before the stream goes live, OneStream will create a live notification on Facebook. Custom event notifications can also be set. More on event notifications here. Facebook will display only the description that was provided. 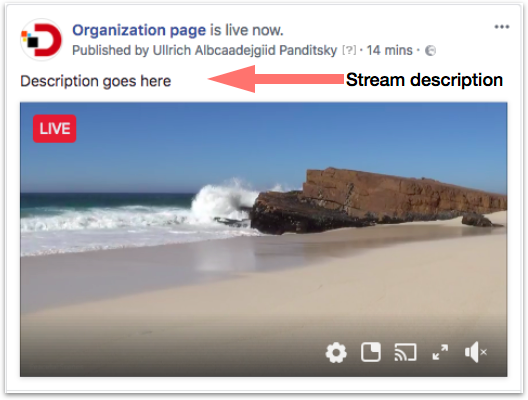 For adding more than 1000 characters in YouTube/Facebook stream description section, you can add more directly on your streaming destination description section.